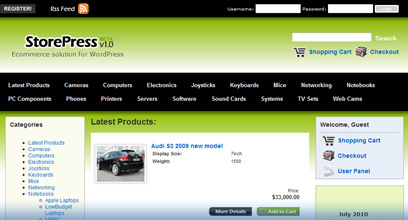 StorePress is the best WordPress theme that will transform your WordPress blog into an e-commerce website. StorePress is a premium WordPress theme, fully coded and packed with scripts that will allow you to transform your WordPress blog into a veritable e-commerce virtual store. Start affiliate stores, or promote affiliate products with this great premium WordPress theme. Find out more about the theme by visiting the demo, and by reading the list of features displayed on this page, by viewing the image gallery and by watching the videos. Here you have a sample video of how easy is to control the StorePress theme’s admin side. The video shows you how to set all the options available from setting the master PayPal email address to where you will collect the money from the selling of your products, to setting custom fees for each product category.